THE SIGN on the copy editor’s desk said, “Next mood swing in 8 seconds.” It always brought a smile to my face, and it was pretty darn close to the truth in the war room of the copy desk at the Los Angeles Times (where I once worked), where editors have to negotiate last-minute story edits and be the last line of defense on errors before publication, all while racing against the clock of the daily deadline. Mood swings aren’t confined to newspaper editors, though. They are a fact of life for all of us. Our mood is highest on Friday and Saturday (for some reason), lowest on Monday. Mood tends to be high in the morning and low at night. Weather can affect mood, as can headlines, things people say, traffic, and too many other influences to list here. Each of us cycles through multiple moods several times a day. Depending on how we feel, we may be gung-ho to take on a project or be immobilized by a pessimistic funk. Like stress, moods are often reactions to events and operate behind the curtain of consciousness, pumping us up, shutting us down, leaving us at the mercy of whatever feeling has bubbled to the surface. Moods have a big impact on what we get done during the day, how much we get done, the decisions we make, and the stress that we feel. Researcher Marcial Losada found in a study that looked at the behavior of business people in meetings (using a two-way mirror for observation), that those with positive mood, who asked questions, didn’t go on the defensive, and used positive framing in their language, were more productive employees, had better sales, and got along with others better. Maybe we should pay more attention, in that case, to the emotional levers of mood, since they have such an impact on performance, motivation, interest, persistence, and satisfaction, among many others. These are some of the reasons that my work-life balance, stress maangement, and time management employee training programs teach the power of optimism and the resilience that comes from it. Without awareness of our mood or how to change it, we wind up little more than a marionette to the urgings of autopilot emotions set off by events out of our control. We’re all familiar with how things go results-wise when the day gets off on the wrong foot. Everything seems harder, takes forever, as intrusive frustration, sadness, or anxiety gets in the way of what you’re doing. The tone tends to spread throughout the day. Researchers have found that the opposite is also true: Get off to a good start in your workday, and more good things happen. 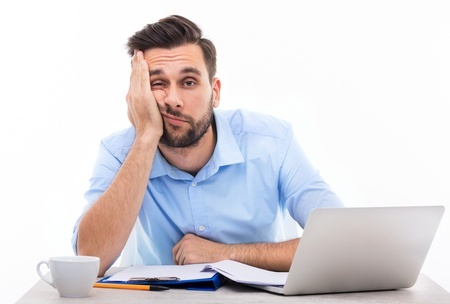 Nancy Rothbard of the Wharton School of Business and Steffanie Wilk of Ohio State found in a study conducted with customer service representatives that those who started out the day in a calm or happy mood generally stayed that way. Interaction with customers didn’t reduce that emotional state, but increased it. On the other side of the spectrum, people who began their mornings in a bad mood finished the day that way. Not surprisingly, those in a negative state were 10% less productive than their positive colleagues. In the same way that moods imperceptibly latch onto us, they also spread those emotions, positive or negative, to the people we are working with or trying to sell a product to. Emotions and the expressions of them in the tone of voice or facial expressions of others are highly contagious, thanks to mirror neurons in the brain designed to simulate the emotions of others. It's a social bonding tool. The positive emotions we generate set off those same emotions via mirror neurons in others. When you’re in a negative or pessimistic frame, that triggers a similar attitude in others, which comes back at you to reinforce an unhappy or irritated state. The work of Barbara Fredrickson, author of Positivity and the leading researcher in positive emotions, has shown that positive emotions broaden and build us. We are more open, take more initiative, meet new people, take more risks, feel more confident, bounce back faster. A pessimistic state reverses the outward direction, and we wind up bottled up in an internal bunker, distracted by frustrations, anxieties, cynicism, or fears. The focus is on me, me, me, and that shreds our chief productivity tool, attention, as we retreat into the fallacies of the ego. Moods are ephemeral. They come, they go. We don’t have to be their prisoner. We don’t have to take them seriously or have them put the kibosh on starting a new project, reaching out to others, or enjoying our lives. We can change our mood in an instant. Think of something you should be grateful for that you haven’t been paying enough attention to, and a down mood disappears. The experience of gratitude wipes the surface ego-clinging emotions clean. How do we get off to a positive start each morning? It starts the night before. The science of work recovery shows the way. If you don’t get rid of the stress and thoughts about the demands of the day when you get home from work, that stress and negative emotions follow you to work the next morning, researchers Sabine Sonnentag and Charlotte Fritz report. When you recharge brain and body through activities that build positive mood, you go back to work the next day in a positive frame. We all need work recovery strategies to detach ourselves psychologically from the events of the day. After-work recreational activities from running to going to the gym and relaxation processes such as reading, listening to music or meditating can help you make that break. The most effective tool to get mental separation is through mastery experiences, activities that allow you to learn and increase your core need of competence—aikiko, a dance class, playing an instrument. You feed your core identity this way, not just your performance identity at work, and that allows you to feel good about yourself no matter what happened at the office. You can also do things in the morning before you start work that get you out of your head and into positive contact with others. Have a light conversation with the barrista, the garage attendant, your neighbor and you can get an attitude adjustment. What music makes you feel good? Use it on the way to work or during the day to lift you up. The grea,t retired voice of the Los Angelee Dodgers, Vin Scully, would play opera and classical music in his car on the way to the broadcast booth to sustain that genial spirit beloved by millions. The lesson of a host of behavioral science is that being buffeted around by stress and moods isn't very smart. We are more productive and happier when we are proactively doing something to manage the negative and accentuate the positive. We are not tree stumps. We can make choices that change our world for the better. To get your team off to a good start and stay that way, click the button below for details on my work-life balance and stress management training programs. TO ERR IS HUMAN; to forgive divine. Especially when it comes to forgiving ourselves. It’s hard to let an unforced error or rough event go. We can be tougher on ourselves than the worst boss. That’s despite the fact that most of life is trial and error. Setbacks shake our confidence and faith, but they are not the end, even if they seem that way. That is because the essence of our species is adaptability and resilience. It’s hard to see that when we are in the middle of adversity, but we are super-hardy characters. Life itself is tenacious. I was hiking in Kings Canyon National Park a couple weeks ago on a trail that leads into the backcountry of one of America’s wildest parks. 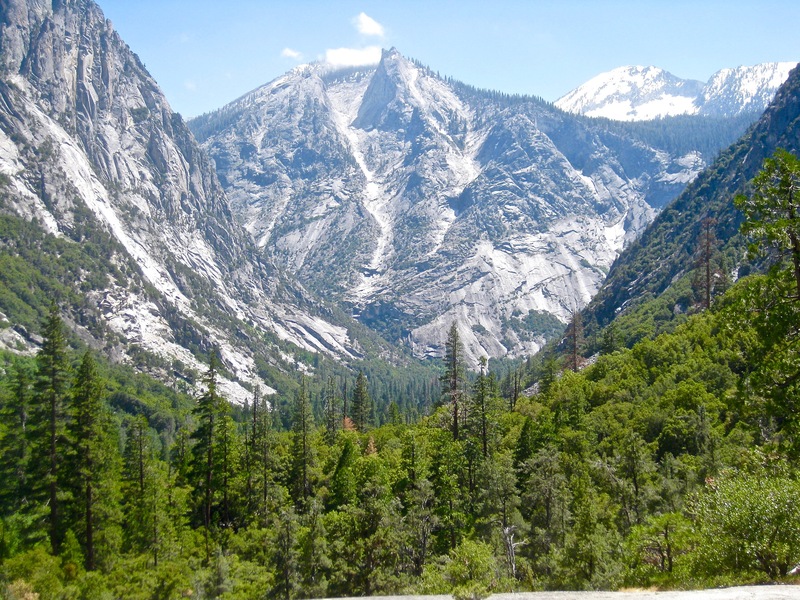 The trail follows the ascending South Fork of the Kings River, a raging whitewater flood after this year’s snows, and rises in the shadow of massive granite cliffs on either side gouged out by glaciers thousands of years ago to form a natural stadium carpeted by conifers. Yet even on the steep walls of granite, it was easy see how stubborn life is. 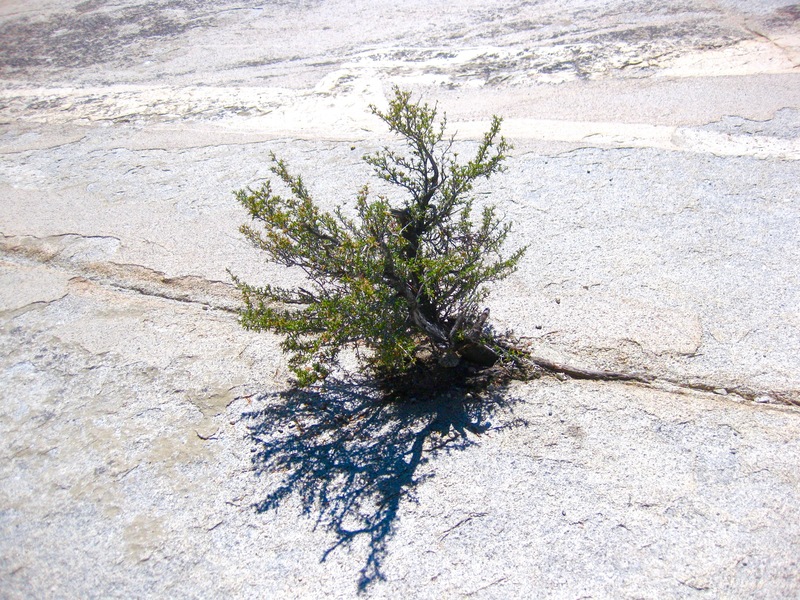 Sugar pine and manzanitas pop out from slivers of cracks in the sheer granite. Seeds blown hundreds of yards by gusts or deposited by birds fell into cracks, and nature did the rest. The trees hang on as if glued to the rock through bitter, stormy Sierra winters, roots battling solid rock to make a stand where they have no right to be. Get a foothold, and you can persevere, they tell us. For humans, that foothold comes in the form of a nutrient that helps us persist no matter what shakes us: optimism. It allows us to let go of negative events and the lingering thoughts about them by shining a light on a path forward. It doesn’t end pain and prevent further setbacks, but the more you exercise your option to adjust to circumstances by taking a positive view, the more you broaden and build resiliency to life's slings and arrows, something we learn how to do in my stress management training and resiliency keynotes. Winston Churchill said that the pessimist sees the difficulty in every opportunity, while the optimist sees the opportunity in every difficulty. As researchers led by Barbara Fredrickson at the University of North Carolina have discovered, the positive emotions that come from the optimistic approach broaden and build our resistance to setbacks and increase resilience by focusing on the opportunity in difficulty. Most of us would assume that the essence of resilience was something more macho than optimism. It doesn’t feel “warrior” enough, but the research shows it most definitely is. When we can see past the mistake, setback, or reversal through a belief that the verdict is not final, that all is changeable and momentary, we are defeating our toughest enemy, the inner critic/doubter that wants to stamp every adversity with the mark of permanent failure. It takes serious fighting ability to shut down the default to view a setback as calamity, which is what the false beliefs triggered by the stress response want you to buy. We can overcome, though, by using what’s known as optimistic explanatory style to vanquish negative events. It’s an adaptive skill that allows us to reframe events away from the negative three Ps, as the University of Pennsylvania’s Martin Seligman calls them—taking things not as “permanent, pervasive, and personal,” which is our first instinct, but as temporary, specific, and non-personal, as one-time, one-off situations that don’t effect every facet of our lives. Some lucky people come by this skill naturally, always finding a silver lining or having a bias for action that allows them to take steps immediately forward that get them out of rehash, rumination and dwelling on the setback. Yet anyone can fight off the trap of pessimistic framing and bunker mentality if they know how to challenge the stories in their heads. Managing the stories we choose to buy or not in our brain determines everything—self-belief, confidence, spirit, vitality, defiance, resistance, persistence, internal validation, all the tools we need to overcome setbacks. Most of the time, though, the thoughts and their stories are managing us, instead of the other way around. We take the most ludicrous thoughts seriously—because they are in our head. They must be true. No, there is a lot of flotsam and jetsam sloshing in and out of our heads without our cueing any of it. Automatic thoughts. Worries. Fears. False beliefs. Our mind has a mind of its own. Taming that mind and the nonsense it can dream up is a daily practice, choosing what to ignore, what to reflect on, what to reinterpret and frame. This latter piece is the foundation of resilience, in which we counter the worst-case mindset with the power of possibility. Oz Sanchez was a 25-year-old Navy man riding his motorcycle in San Diego when a car ran a stop sign and sent him flying off a 12-foot embankment. He landed on his back on a pile of rocks. He suffered a spinal cord injury, just a few days before his wedding. In an instant all hopes for the future were obliterated. Perfectly understandable. What could be more defining as permanent than a spinal cord injury? Why go on? The blow seemed too hard to bear. Months and months he lay in a body cast. Feeling helpless was a new experience for Sanchez, who was a proactive personality by nature. His friends and family tried to encourage him, but it seemed bleak. One day at the hospital, though, he saw a wheelchair with a hand-cycle used for racing. It touched off a curiosity, one of the most important ingredients in finding a new path forward. Could he do that, pedal with his hands and compete in a sport? The idle thought turned into a goal to try, and the cracks in permanence began. He began to build his upper-body strength and endurance, empowering acts in themselves. After a year of training, he entered a 10K race and finished it. It was exhilarating not to feel helpless. He was back in touch with his core needs of autonomy and competence, which we all need to feel gratified. Sanchez learned that he was not permanently exiled from movement, life, and achievement. He could change things. Photo: Oz Sanchez in action. He would go on to become a multiple world champion in the sport of handcycling, and he won a gold and a silver medal at the Beijing Paralympic Games. Today, he is a renowned athlete and motivational speaker. He is not alone in his comeback. Studies show that the majority of people who suffer spinal cord injuries go back to the well-being set-point they had before their accident. We are remarkably resilient. The course Sanchez took was fueled by the courage to adapt, adjust, and imagine what-if. He got around the setback by not viewing it as an end to all aspects of life, to his self-definition, to potential achievements. Instead, he saw it as something that he had to work around and work with. His state and most importantly, the way he thought about his situation, was changeable, a key factor in optimistic explanatory style. The story he wound up telling himself was not “woe is me,” or “why me?” He opted out of helplessness, a major driver of depression. 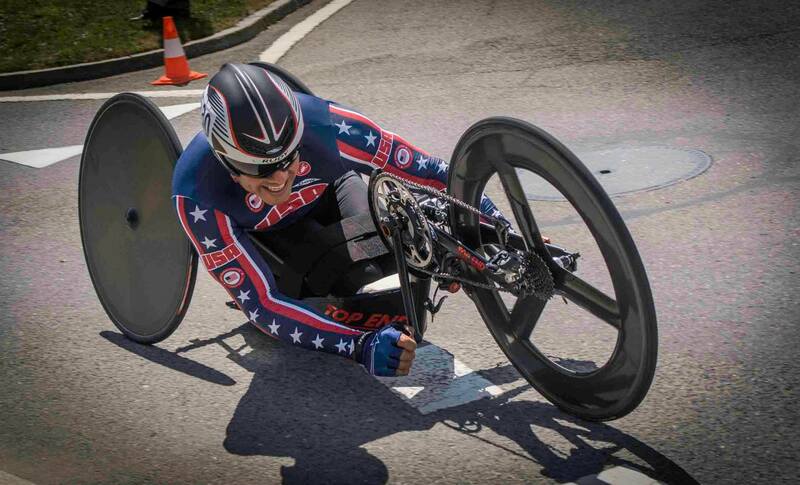 He took a proactive course to physical training, learning a new skill, handcycling, and he also set a goal of getting his business degree, which he did. None of it would have been possible without Sanchez being able to reframe his story from a permanent catastrophe to a challenge he could surmount. There is so much more in us than we ever tap, and it has the possibility to emerge when we rise to the challenge of setbacks and not allow them to define us. Negative events we experience and the emotions they set off in us are ephemeral. Only we can perpetuate them by clinging to them and bucking the nature of life: change. The adaptable species may not love to change, but embracing it is what life is all about—growth. That’s what our core, the brain, wants—progress. Like the tree sprouting from granite, we can make our stand wherever we find a toehold, however small or cramped or exposed. Then we set a course for growth, rising above momentary emotions and circumstances no matter what the elements throw at us. Take charge of the obstacles in your life or on your team. Click on the buttons below for details on my stress management training and resiliency keynotes.